Minted at officina P in Ticinum (Pavia, Italy) between 300 and 303 A.D., during his reign as Caesar under Diocletian. Sutherland, C.H.V., "Roman Imperial Coinage", Volume 6 (RIC), Ticinum, p286, nr 44b. hinterlassenen Sammlung und Aufzeichnung des Herrn Paul Gerin" (Voetter-Gerin), Tarraco, Galerius Maximianus, p322, nr 11. Sear, D.R., "Roman Coins and their Values" (RCV Millennium Edition), Volume 4, p286, nr. 14403. 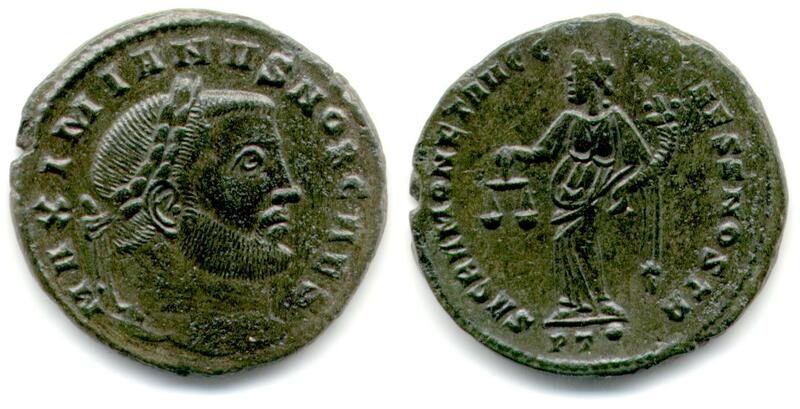 Failmezger, V., "Roman Bronze Coins From Paganism To Christianity 294-364 A.D.", nr 28G, reverse legend variation.